Then he shuffles the 10 Action cards of his colour and places them face-down at his right: these cards are his personal deck. Each player also takes a $250 Purse from the stock and places it face-down on his Character card, keeping its value hidden. In the center of the table, place the Locomotive and as many Cars as there are players in a row. Take the Cars of your choice and placed in the order of your choice. Add the Locomotive to the front of the Train. Place in each Car the number and type of Loot tokens indicated on its floor. The Purses are taken at random and placed face-down with their value hidden. Place the Marshal pawn and a Strongbox inside the Locomotive. The remaining Loot tokens are put back into the box, except the second Strongbox, which is placed off the Train, near the Locomotive. It may come into play later. Randomly draw 4 Round cards from those 7 which correspond to the number of players (either the Round cards marked 2-4 or those marked 5-6) and shuffle them. Randomly select one of the three Train Station cards. Make a face-down deck with these 5 cards, making sure that the Train Station card is on the bottom. Put the remaining Round cards back in the box. Place the 13 Neutral Bullet cards next to the Locomotive. 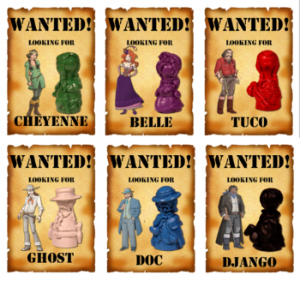 Take the Bandit pawns corresponding to the played Characters and draw one of them randomly. The player corresponding to the drawn Character is the First Player for the First Round. This player takes the deck of the 5 Round cards and puts it in front of him. The First Player is Player 1, the player on his left is Player 2, and so on. 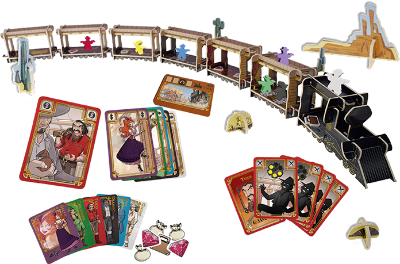 The players with an odd number place their Bandit in the Caboose. 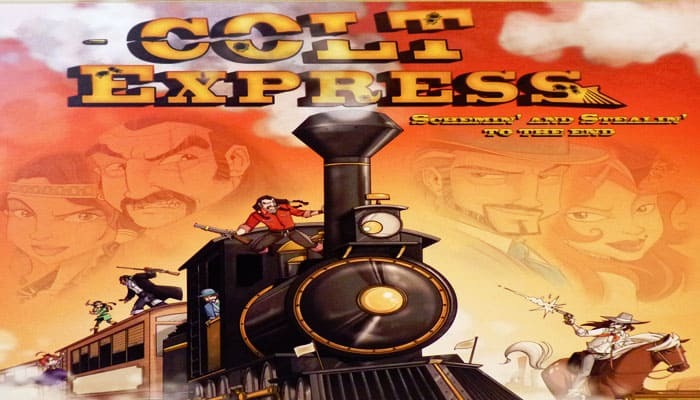 The players with an even number place their Bandit in the Car next to the Caboose. To win, you must become the richest Bandit in the Old West. To reach this goal, you will try to get more Loot than your opponents...without being hit by too many bullets! The best shooter will receive the title of Gunslinger, worth $1000. Phase 1 : Schemin'! The players play their Action cards into a common deck in the center of the table. Phase 2 : Stealin'! The Action cards played during Phase 1 are performed. At the beginning of a Round, each player shuffles their deck and draws six cards. These cards form that player's Hand. Then the First Player draws the top Round card and places it on the table so that everyone can see it. This Round card shows the number of turns (the number of Card icons) there will be during this phase. It also shows how the turns will go. Starting with the First Player, each player plays their turn, followed by the next player in clockwise order. or take 3 additional cards from his deck and add them to his Hand. The Schemin'! phase ends when the number of turns indicated on the Round card has been completed. Any unplayed cards remaining in a player's Hand are placed back on the top of his personal deck. Example: Doc is the First Player during the current Round. He plays a Move card from his Hand; then Belle, on his left, plays a Fire card on top of Doc's card. Tuco, on Belle's left, decides to draw cards instead of playing a card. He takes 3 cards from his deck and adds them to his Hand. Finally, Cheyenne plays a Punch card on top of Belle's card. Then the second turn begins. The First Player takes the deck of Action cards that had been created during the Schemin'! phase and turns the deck over, without changing the order of the cards. The Bandits' Actions are performed, one by one, starting with the top card (i.e., in the order they have been played). Once performed, the Action card is given back to the player to whom it belongs. That player puts it back on his personal deck. Each player shuffles all his cards (10 Action cards and any Bullet cards he has been hit with in previous Rounds). Then he places his deck to the right of his Character card. The player on the First Player's left becomes the new First Player. He puts the remaining Round cards in front of him. A new Round now begins. The game ends after five Rounds. Each player then adds up the value of the Loot tokens they have on their own Character card. The Gunslinger prize is awarded to the player(s) who shot the most bullets (i.e., who has the fewest Bullet cards of their colour left). The player(_) turns his Character card over to get the prize. It is worth $1000. If more than one player wins the title, each tied player gets $1000. The richest player wins the game. In case of a tie, the winner is the tied player who has received the fewest Bullet cards from other players and Events during the game.